Mini Display port The adapter can seamlessly connect Mac Book, Mac Book Pro, or Mac Book Air with a Mini display port to high definition displays. Support HDMI/DVI/VGA output with the max resolution of [email protected], 225MHz/2.25Gbps per channel (6.75Gbps all channel), 12bit per channel (36bit all channel) deep color. The product is easily and conveniently use, with three output ports: DVI VGA HDMI and a Mini Display Port. And you can use one of them at a time as your demand, when you want to use the DVI output; you just need to connect the DVI devices using a DVI cable. And when you want to use the HDMI output, you just need to connect the HDMI devices using a HDMI cable. When you want to use the VGA output, you just need to connect the VGA devices using a VGA cable. 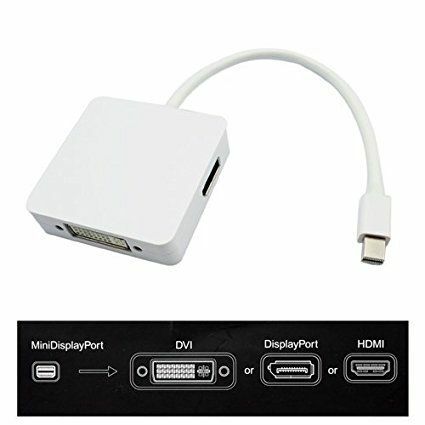 The Mini Display Port needs to be connected with Mac Book, Mac Book Pro, or Mac Book Air.